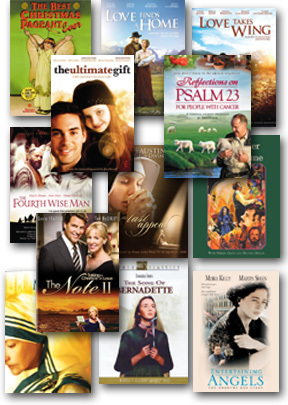 This Set of Twelve includes Best-Seller titles:Love Finds a Home, The Fourth Wise Man, Entertaining Angels, Reflections on Psalm 23 for People with Cancer, Mother Teresa, Song of Bernadette, Love Takes Wing, The Note II: Taking a Chance on Love, The Ultimate Gift, Last Appeal, Juggler of Notre Dame, and The Best Christmas Pageant Ever. BEST CHRISTMAS PAGEANT EVER: Loretta Swit stars in this touching and humorous Christmas story. Beware of the Herdmans! The nastiest, dirtiest kids you could meet…and they've decided they belong in this year's Christmas pageant. The town thinks they belong in the care of the local police. But when the curtain goes up, a miracle begins! Over 2.5 million books sold! THE FOURTH WISE MAN: The Story of the Other Wise Man, this fictional story set in Biblical times is told in gently comic terms. A Magi named Artaban sees a sign in the heavens that he hopes will lead him and his faithful servant to the Messiah. A deeply moving experience examining what true faith really means. REFLECTIONS ON PSALM 23 FOR PEOPLE WITH CANCER: Ken Curtis explores coping with advanced cancer from personal experience based on the inspiration of the 23rd Psalm. Over 3,000 years ago, Israel's King David wrote what has become the most popular song in the entire history of the world. It is known as the 23rd Psalm. Its words have brought more comfort and courage to more people at more times at more places than any other words ever written. When you combine its comfort and courage, then hope is generated. And hope is one of the most essential and valuable resources to help anyone suffering from cancer or from any major illness or setback in life. LOVE TAKES WING:Wounded by the recent death of her husband, Dr. Belinda Simpson arrives in the tiny town of Sikeston to take up the post of town physician. Soon, Belinda begins to worry that she is in over her head. Unfortunately, the residents of Sikeston aren’t as trusting of Belinda’s abilities as a doctor - mainly because she’s a woman. Opposed by what seems like the entire town, Belinda must trust in her abilities, her friends and her faith to guide her. LOVE FINDS A HOME:The story continues of Belinda, a rare female doctor working in a quaint Missouri town. When her longtime friend and colleague, Annie, arrives so that Belinda can watch over her in the last stages of her pregnancy, Annie brings along her mother-in-law, Mary, a seen-it-all nursemaid whose homeopathic remedies and folksy wisdom are at odds with Belinda’s scientific knowledge. Just as the town learned to put its faith in Belinda as their doctor, so too must Belinda learn to accept that the best guidance for her own problems may come from unlikely sources. THE NOTE: TAKING A CHANCE ON LOVE:When do you take a chance on love? It's a question columnist Peyton MacGruder asks herself and her readers. Haunted by past mistakes, Peyton hesitates to take the next step with the man she loves. But a note from a reader warns about the regret caused by passion denied. Peyton uncovers the author's secret history involving a doomed romance . . . and a love which may yet live again. The characters created by best-selling novelist Angela Hunt return in a romantic tale of love that just might change your life. Entertaining Angels: Like many people, Dorothy Day (1897-1980) just wanted to find fulfillment in her life. Entertaining Angels: The Dorothy Day Story shows how she found it in serving New York's poor and being a voice for the voiceless. Moira Kelly delivers a winsome portrayal of 20 years in Day's life, during which she works as a Marxist journalist, leads a less than virtuous life, then undergoes a religious transformation that changes her life forever. The film shows Dorothy's struggle as she establishes the Catholic Worker movement and commits herself to a lifetime of peacemaking, battling for justice, and hands-on service to the poor. Popular stars and important themes combine in this compelling true story of the "American Mother Teresa," filmed by Paulist Pictures (Romero) from a script by ER writer and executive producer John Wells. Martin Sheen, Melinda Dillon and Brian Keith join Kelly in this moving saga of a faith not just believed, but lived. Juggler of Notre Dame : The story of the Juggler of Notre Dame goes back to at least the 12th century in France as one of the "miracle plays" of the medieval period in which God rewards devout commoners through acts of wonder. In this gripping, heart-warming contemporary version, Barnaby ekes out a bare existence juggling in the street for coins. He is broken-hearted over the death of his wife and best friend. Barnaby drifts aimlessly until he stays in a small community where he is treated kindly. As Christmas approaches, all are making special gifts for the Lord. Barnaby despairs over having nothing to offer until he discovers a most profound truth about the meaning of Christmas and giving. Mother Teresa:illuminates the life story of Mother Teresa, the selfless missionary who brought hope, love, and salvation to the poorest of the poor. A shrewd diplomat and an indomitable force, Mother Teresa is unwilling to accept what others deem impossible, fearlessly fighting for the unloved and the forgotten. Her good works transcend hardships and ultimately earn her international acclaim, including the Nobel Peace Prize. Last Appeal:?The Last Appeal portrays the story of a peasant girl chosen to bring the message of Mercy to mankind in preparation for The Last Day — The Day of Judgment. The drama unfolds through the revelations and visions of God to Helen Kowalska. The story of Helen vividly brings to light the struggles she went through in the process of delivering the message through the humble life of a nun in a convent in Poland at the beginning of the 20th century.